Hey guys! So this is one of those archived posts that just never made it to the blog till now. 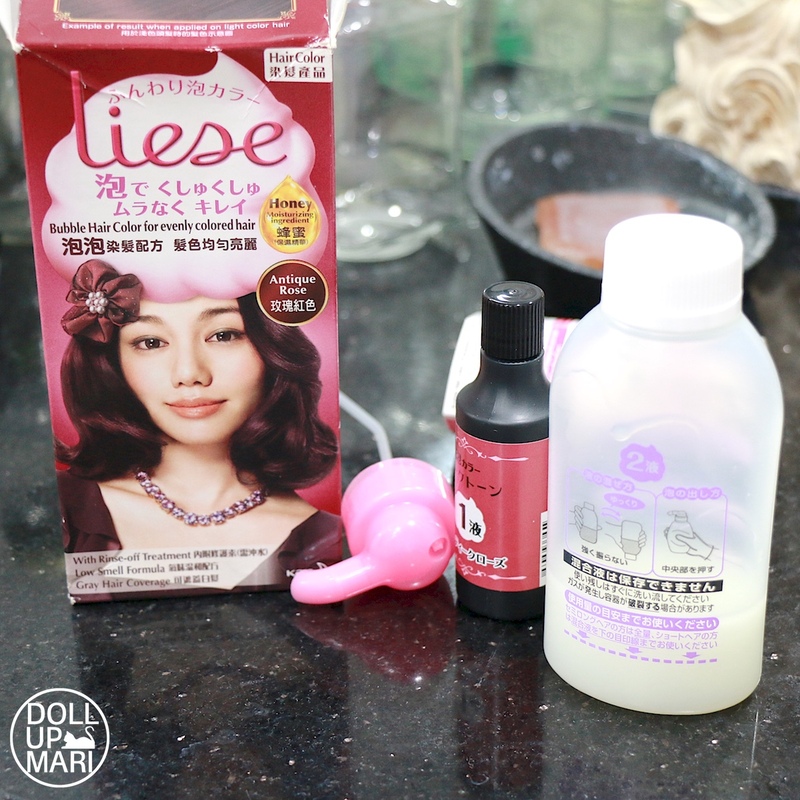 These are photos of my experience with Liese Creamy Bubble Hair color in the shade of Antique Rose. This shade, unfortunately, still isn't in the Philippines, but you can still be happy as the brand in general is now in our soil! So this is how the kit basically looks like. 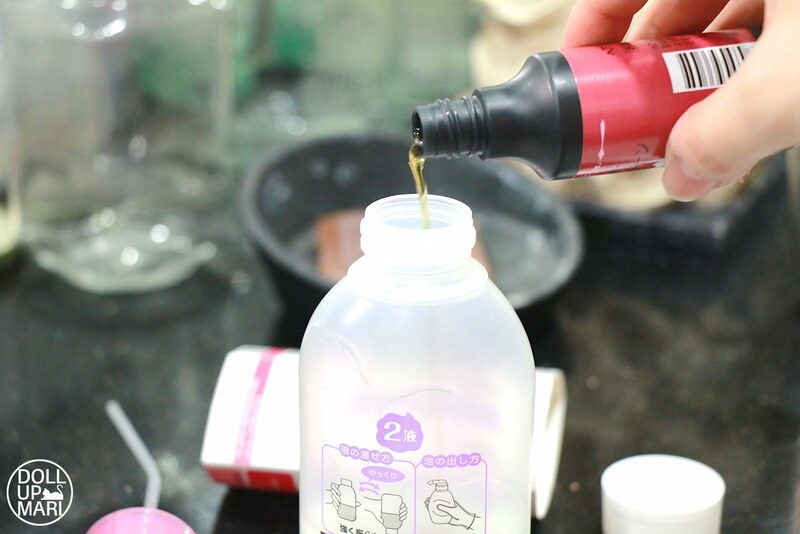 It comes with a color bottle (1) and a peroxide bottle (2). 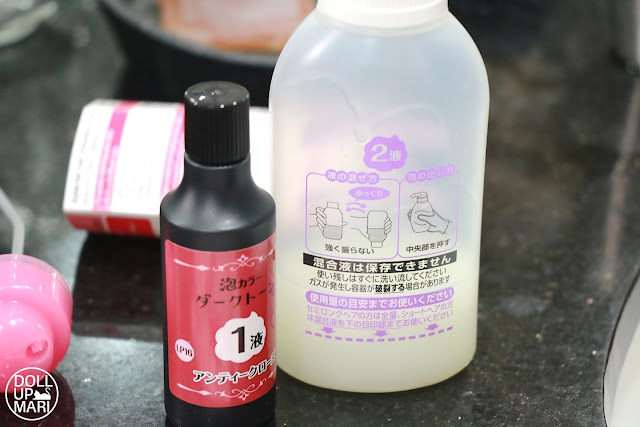 This kit also comes with a pink nozzle for foaming when it's time to use the product, a pair of latex gloves for the user's convenience, and an allergy patch test kit to be used before the dye job. 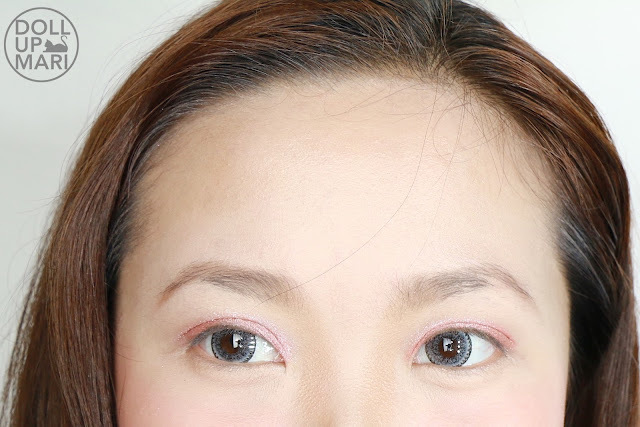 I have already made two other posts over Liese hair color for the Marshmallow Brown and Classic Chocolat shades and that's where I write in detail about the product details and the kit, so you can check those two posts out. Becaaause, I'd like to focus more on the before and after!!! So this is my hair before. 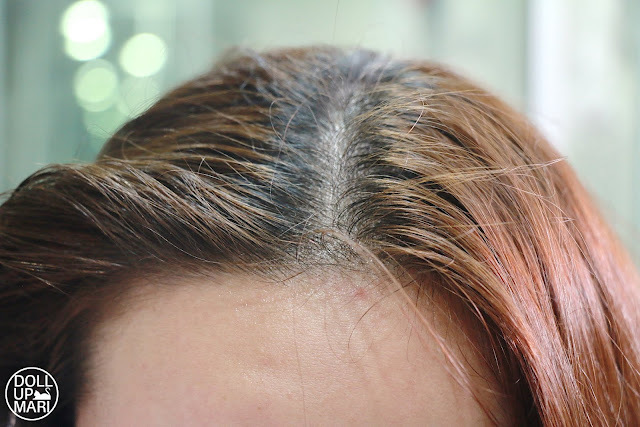 This is their Mashmallow brown shade actually, more of since it was like almost 2 months after I used that one, the shade is already weaker and the regrowth is quite long. Since this is a foam formula, there is no mixing bowl needed. This is all that you will need. 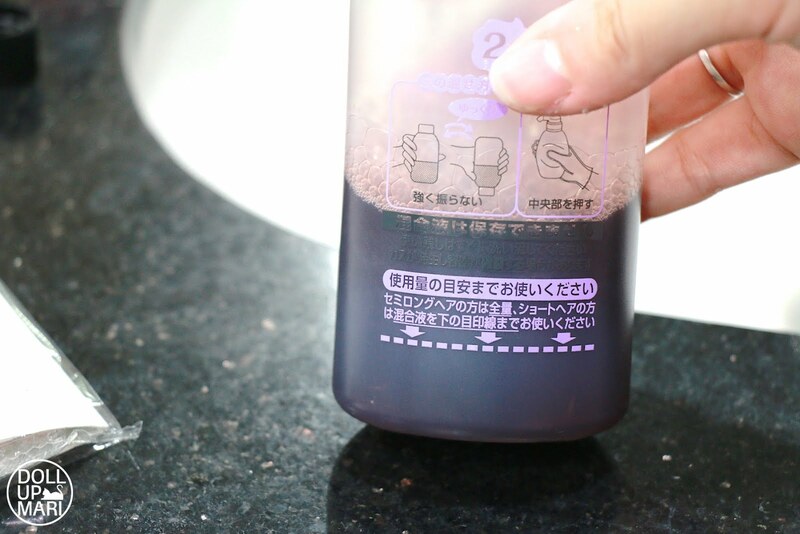 What is important is to simply tilt the bottle a few times and to not shake it rigorously, as too much shaking may produce too much foam and that is not a good thing. They also have another safety warning here. They advise users of short hair and medium length hair to use the product only up to the purple line because using too much foam on too little hair may make the foam end up elsewhere and cause problems. This may be a super cutesy and fun product, but it still is a hair dye, so safety must be of the utmost priority. You can get on with the gloves and get onto dyeing already, but in my case, for blog purposes, here I am using a brush so that I can still take photos while dyeing my hair. It is really professional practice to advise people to not wash their hair before a dye job because the oils of the hair help the dye to seep in better. Also, washing the hair makes it wet, and even the tiny percentage of water left in the hair can affect a dye job's success. It must be remembered that hair dyes are removed by washing them off, so there is no use to apply it on damp hair as its effect is already weakened in the first place. Best practice is to wash your hair at night, sleep, wake up and don't take a bath, use the dye, and then that's when you take a bath. This will work best on Saturday mornings, I think. As for the before and after, I am so sorryyy this was sooo long ago and I was not able to consciously take proper before and after photos of my scalp and stuff. These are prolly the best angles I can provide. This is before the dye job. My hair has more golden tones. This is a few weeks after the dye job, hence the regrowth. But you can see that the tone is more copper-ey and reddish. Overall, I have always liked Liese hair color throughout the years as it's the only one that can color my hair in the boxed dye division. 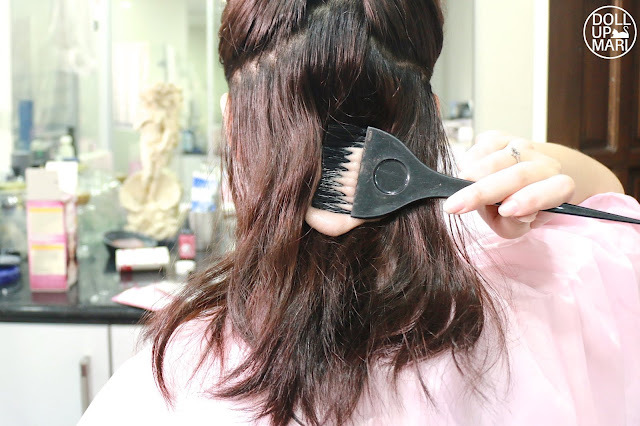 My hair is very chemically resistant, which is why not a lot of coloring products work on me. I like that this has enough strength to color my hair and it comes in shades that young people actually like. I found myself displeased with other brands because the colors are often too dull and are made with the covering of grey hair regrowths in mind. It's the brands like these that make bright colors for young people to really feel like they had a dye job. The result are really nice for something that is DIY, i mean for the manual application of the product into hair at the comfort of your own home. I also like to purchase one like this but I am afraid to do it myself since it will be a first time for me and also a lot of what ifs-like what if will not produce good color or expected result ba blah blah. But as what i have seen on your blog, maybe next month i will try this myself at home, looks fun and I think it is really exciting to see something that is from your own effort.